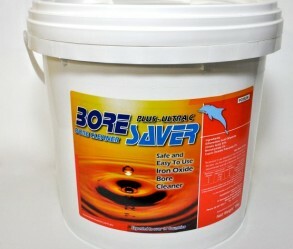 We are agents for Aquabiotics Industrials (www.boresaver.com.au) who supply our entire range of bore cleaning chemicals. All of the chemicals supplied by Aquabiotics have been certified as safe for use in a potable water environment. Boresaver Ultra C is the most powerful product available for iron oxide problems and has been designed especially for screens, wells, pumps, and pipes. It is ideal for water supply systems that have been contaminated with iron bacteria, iron oxide, manganese oxide, and calcium carbonate deposits. Boresaver Ultra C is safe and easy to use, and environmentally friendly – the active ingredients are organic and fully biodegradable. It can be used without dismantling equipment and does not attack or deteriorate any materials inside the system.